Buying a home comes with A TON of benefits. It’s a place to call home. And, it’ll provide you with some flexibility when April 15 rolls by. As a mortgage educator, I constantly strive to offer my clients the latest and most useful information that’ll help them learn about the home-buying process and every step before, during and after the close of their loan. Tax benefits for homebuyers will last a long time, so it’s important to understand how they work so you can take full advantage of these perks. 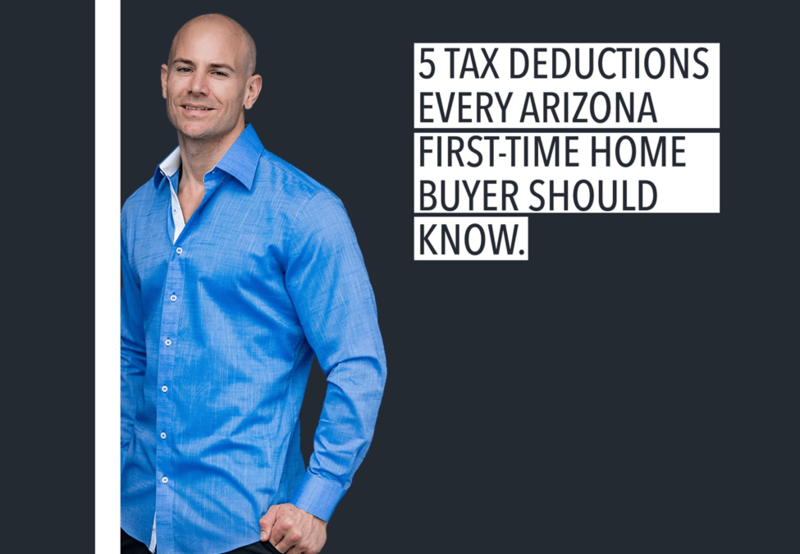 I’ve put together five tax deductions every Arizona first-time home buyer should know. For some new homebuyers, paying a little more money upfront is worth the tradeoff in mortgage points. Mortgage points allow homebuyers to essentially buy a lower interest rate. The good news is that points paid to obtain a home loan are tax deductible. The reason being: points are like pre-paying interest, or payments against interest. This deduction can be worth THOUSANDS of dollars. Every loan comes with a price tag. When you buy a home, you’ll be responsible for financing charges, and this can include mortgage interest. This tax break is perhaps the largest one you’ll enjoy. It covers the interest you paid up to $1 million. And there’s even better news: This tax deduction works well with new loans because of how amortization works. Typically, your initial payments will have the highest interest-to-principal paid ratio. Homeowners should keep in mind that they will need to file an itemized tax return for this deduction. You may be eligible to deduct real estate and property taxes on a primary home. There also may be an opportunity to do the same for other pieces of real estate, including apartments and vacation homes. Starting in 2018, homeowners can deduct as much as $10,000. Nothing quite says home like the personal touches of décor, home upgrades and renovations. If you purchased a home and decided to take on some DIY projects, a tax break may be on its way. An equity loan utilized to pay for the improvements may be eligible. Tracking your home improvements can enhance your eligibility for a tax deduction. Let’s start with the second one. When you make improvements on your home, you can include these costs to determine capital gains or losses on the sale. For instance, if you sell your house for more than what is owed on it, then your costs can lessen your tax liability so you can enjoy more of the money you’ve earned on your real estate investment. Home improvements paid through a loan are treated like mortgage interest deductions, which lowers the impact to your taxable income. If you paid less than 20 percent on a down payment for your home, you may be able to use your private home insurance on your mortgage to earn back some of the costs through a deduction. These money savers are just some of the financial perks of owning a home. If you want to learn more about these benefits and the long-term payoffs of being a homeowner, please do not hesitate to reach out.